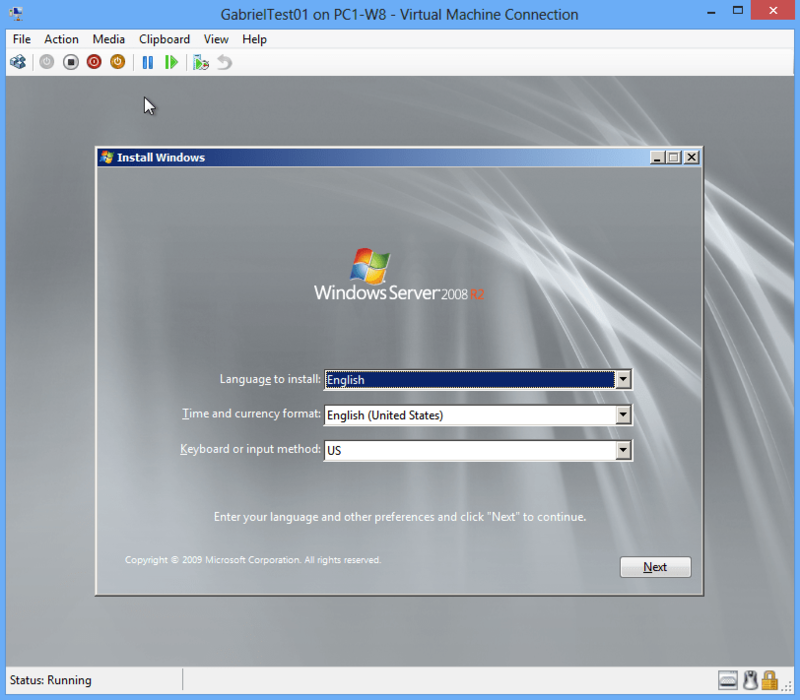 This Blog post is based on the RTM version of Windows 8 desktop. 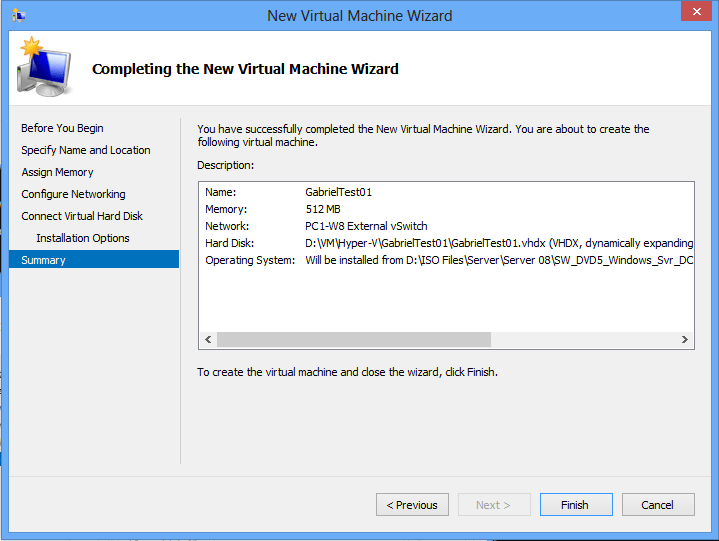 One of the features that I am excited about with the Windows 8 desktop, is the ability to run a full-fledged Hyper-V virtual environment natively. I am a Systems Administrator by trade, and I constantly need to setup virtual machines (VMs) on my local machine/network to test resolution of issues in a Windows Server production environment, and I utilize different Operating Systems (namely FreeBSD and KDE based Linux based distros) often. 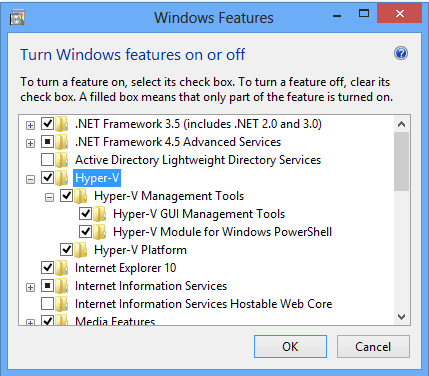 The purpose of this blog post is to give you step-by-step instructions on how to enable, configure, and get started with Hyper-V on your Windows 8 desktop. In the past, I was forced to use third party software, such as VMware Player/Workstation, Virtual Box, etc. Having this feature available in-box is a very attractive solution for many reasons. 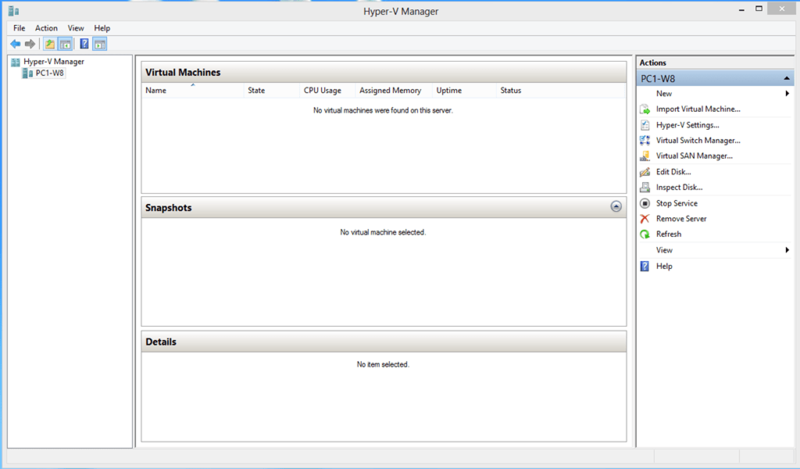 Integration between my Hyper-V environment and my desktop will be tight. Microsoft will be providing updates, security, and support for this. Plus we eliminate third party updates, security vulnerabilities, and it’s FREE. For advanced features with VMware you have to pay for VMware Workstation. The first thing you will need to do is enable the feature. 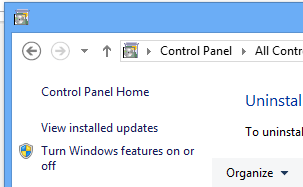 Open Control Panel > Programs and Features. Then click the Turn Windows Features On or Off option on the left-hand side of the window. After a moment, you will be presented with the Windows Features window. I opted to install the whole component. 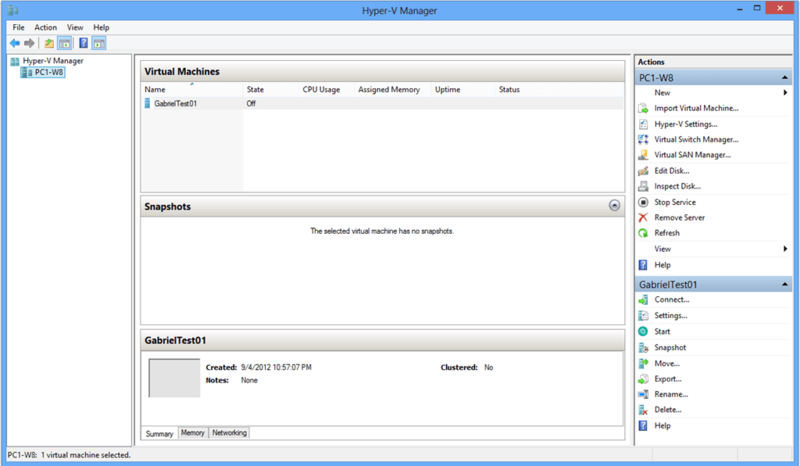 This will install the HV GUI management console, the Windows PowerShell Module for HV, and will install the HV Platform itself. With these three pieces, we have everything we’ll need for a HV environment on your laptop or PC. First, we’ll setup the virtual switch. In the far right column, click Virtual Switch Manager. 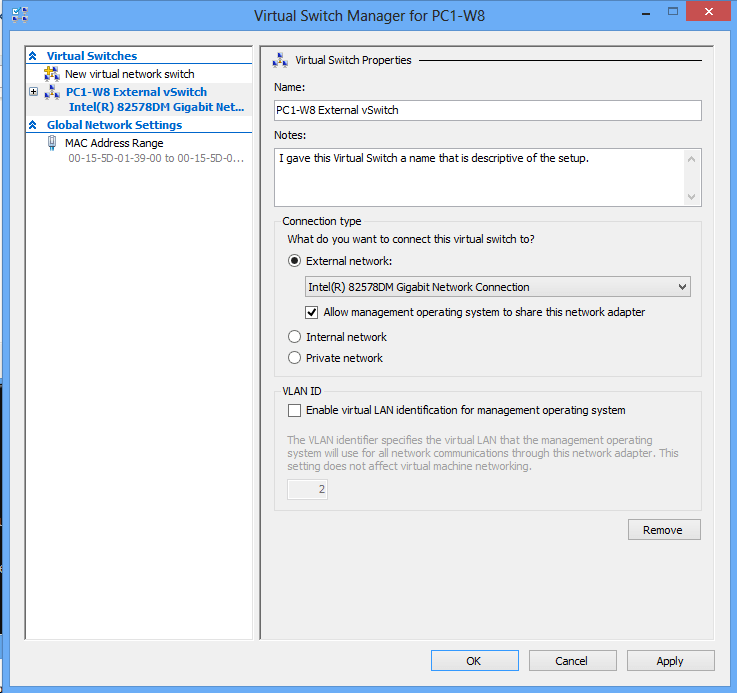 You’ll be prompted with the Virtual Switch Manager configuration. You have three options, External, Internal, and Private. We want to use External switch as this will provide complete network access to and from your VMs, to your host, the local network, and the internet. 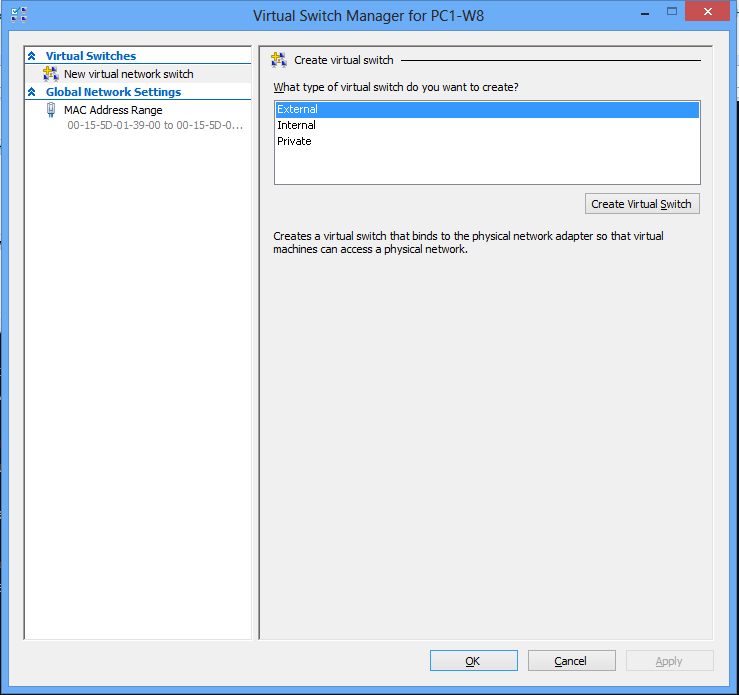 Select External and then click Create Virtual Switch. Next, I recommend changing the default Name: to something a bit more descriptive. Make sure your External network adapter is chosen, and if you are utilizing VLANs in your home, make the appropriate selection here. Then click Apply, acknowledge the popup. You will lose network connectivity for a brief moment, and click OK.
Now that our Networking is configured, lets build our VM. On the far right column, Click New > Virtual Machine. 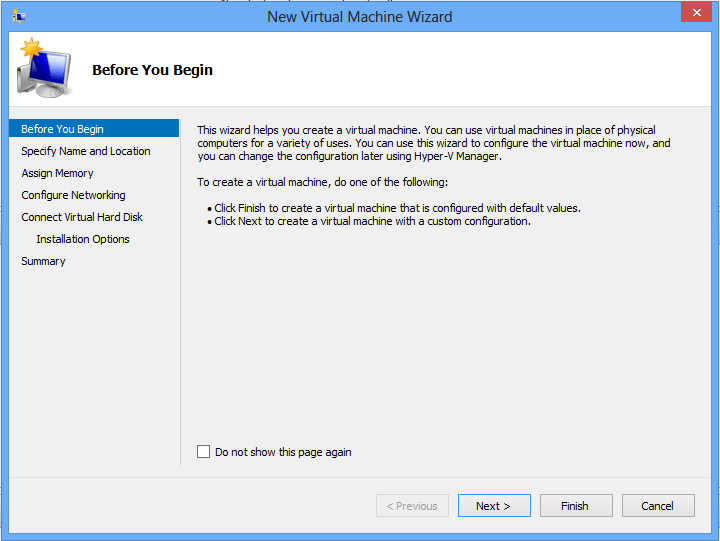 Then you will be presented with the first screen of the New Virtual Machine Wizard. Click Next. 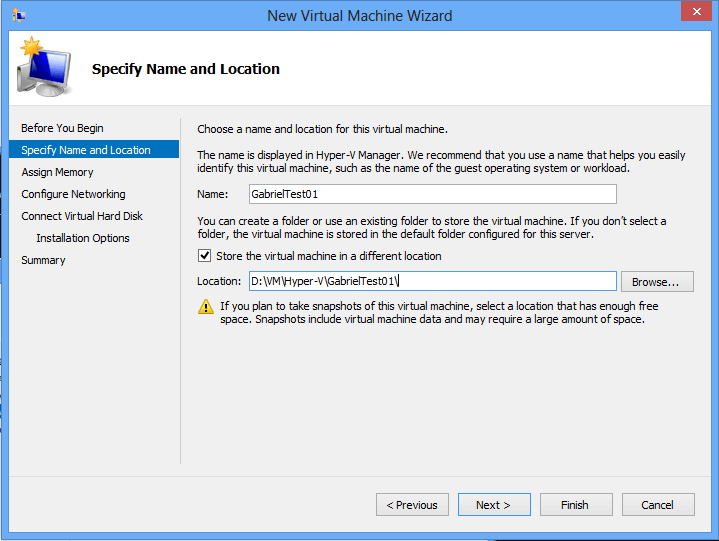 Next you will name the VM and select where you want to store the VM. I highly suggest saving your Virtual Machines on a different hard drive than that of your Operating System. Perhaps, utilizing the new Storage Spaces feature built-in to Windows 8. In my case, I have a D: drive where I store my data. 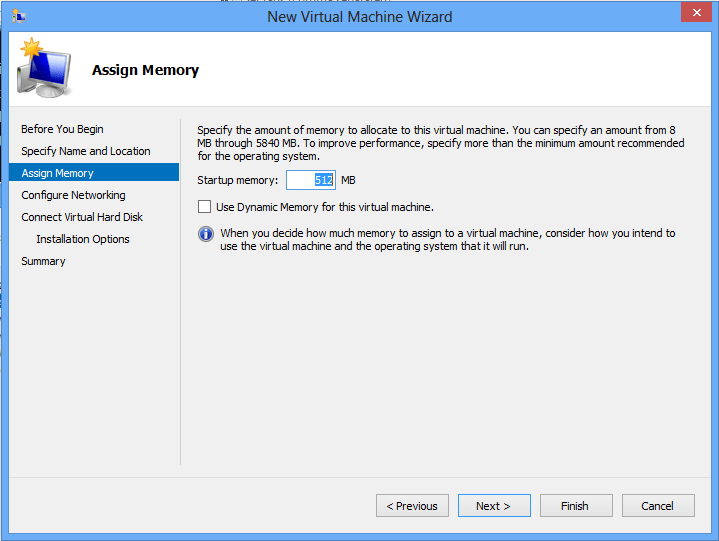 I have selected Store the virtual machine in a different location, and set a path. 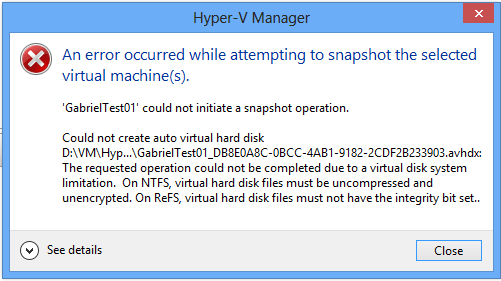 I recommend this file structure: “Drive:\VM\Hyper-Visor(HV, ESX, VBOX, etc.)\VM_NAME”. Next assign the memory, in this case just for a test 512MB is just fine. We can always change this later. 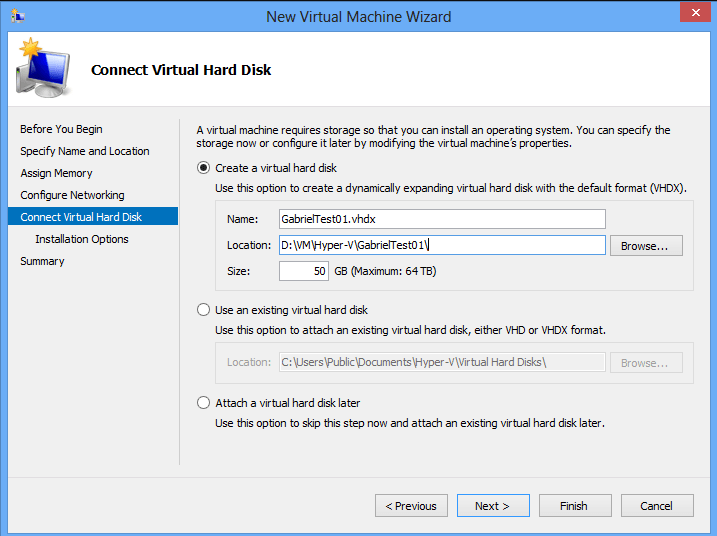 Next, review the settings for your Virtual Hard Disk (VHDX) file. I recommend storing the VM files and the VHDX together in the same directory. So we’ll use this same path from above. I also set a maximum of 50GB, the default will vary depending on your free disk space on the destination drive. I recommend setting a value like this, in fact for testing 50 GB is a bit much. *Note – Notice this is a dynamically expanding virtual hard disk, meaning that the disk space is thin provisioned, and will only be consumed as it is used. So 50GB is the max it can grow. I have the Windows 2008 R2 ISO on my hard drive, I’ll go ahead and map it here. This can be done later if you don’t have the ISO file yet. 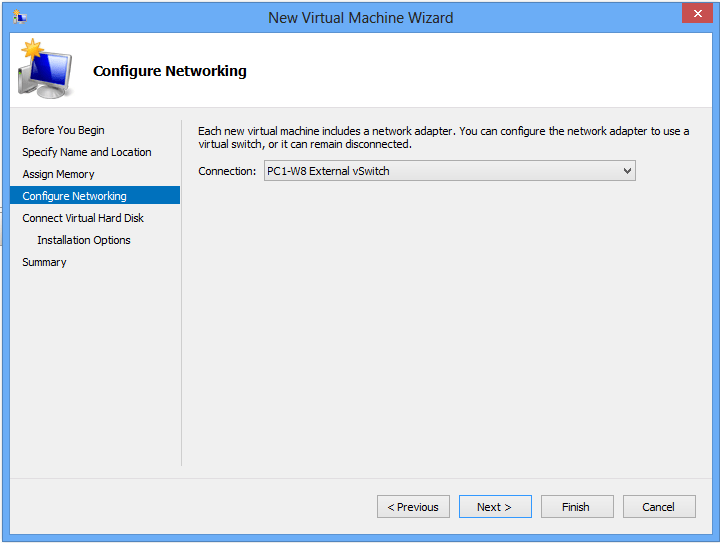 Right-click on your VM, click Connect… Then power on the VM from the console. Since I mapped the ISO, it boots quickly and I am ready to install my guest OS. And that’s it! 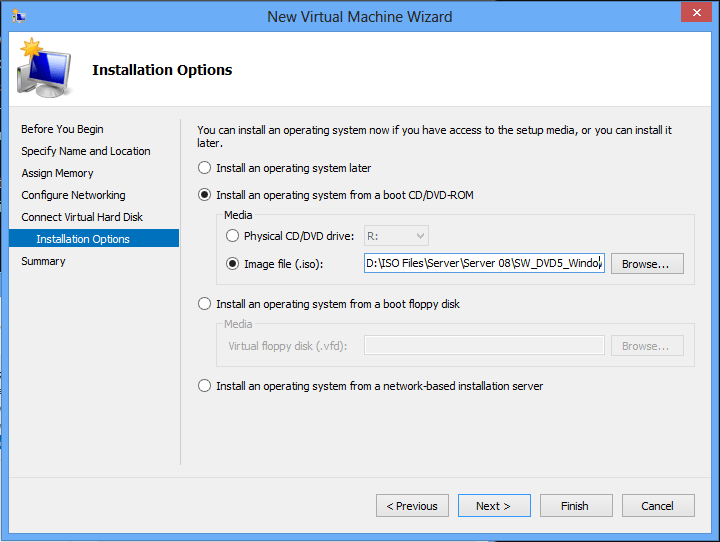 It is very simple to get up and running with VMs on your Windows 8 PC. I will be testing different Operating Systems and configurations over the next few weeks and will do a write up on any bugs or issues I encounter. This IMHO, is an excellent feature and a step in the right direction for the Windows desktop platform. Happy Virtualization!